Elasticcon is a wearable device with a retractable string and exchangeable traction knobs. It is a flexible, mobile controller providing a rich interaction space including isotonic and elastic input. To obtain more information of a component please select a entry in the list. We used a dentless 24-step incremental rotary encoder to measure the pulling distance by referencing the rotation state (approx. 1.1mm res., Ø45mm spool diameter) of a spring-loaded wind-up mechanism. In order to achieve a higher resolution, we process the quadrature encoded signals with 4X counting and very efficient interrupt routines, which uses the external interrupt pins of our Arduino controller. The rotary encoder is mounted above the slip ring and has a hole in his center to lead the three-wired traction cable out of the spinning spool to the central board. In order to realize the traction functionality, we a used a commercial retractable key reel from KEY-BAK for the winding mechanism. Therefore, we carefully disassembled the mechanism and replaced the default string with our traction cable and mounted the slip ring on top of the spool to avoid cable twisting. We mounted a slip ring on the top of the main spring. The slip ring with its center at the origin transmits 5V power and two analog or, as needed, pulse-width modulated control signals from the casing through the rotating cable reel to the draggable traction knob. Our Elasticcon cable is a thin (Ø2.2mm) three-wire standard audio cable. It was a challenge for us to maintain the right balance between a robust and flexible cable that is, on the one hand, able to roll up onto a spring-loaded wind-up mechanism and is, on the other hand, able to withstand the pulling force of a human. The set of traction knobs is made of custom Ø35mm polyester resin spheres and cylinders with two symmetrical depressions suitable for a safe and pleasant grip. To realize the different combinations, we used standard components including a rotary encoder, a Force Sensitive Resistor (FSR), miniaturized tactile buttons, vibration motors and symmetrical rocker switches with a neutral position. 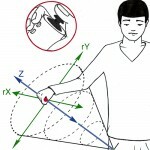 The directionality of the corresponding pulling direction is tracked by a two-axis cardan joint from a regular thumb joystick. We decided to use the "SparkFun Bluetooth and LiPo Add-On for Makey Makey"-Module to handle the power and realize the wireless communication. The module provides a simple and flexible way to connect our 3.7V lithium-polymer battery via a 2-pin JST connector. The integrated charging circuit enables an easy way to charge our Elasticcon via the connected Arduino board using the micro USB connector. In addition, the built-in RN-42 bluetooth chip offers many configuration possibilities including the support of the Serial Port Profile (SPP) as well as the Human Interface Device (HID) protocol and further adjustable settings, which could be set via command mode and are very important for us. Our main logic board consists primarily of an Arduino Micro that is based on the ATmega32u4. The board with its comprehensive digital input/output pins, small form factor, built-in USB communication and sufficient clock rate of 16 MHz meets all of our requirements of a tiny powerful and flexible MCU that we need. We integrate two miniature slide switches: one for power and the other for the HID mode (mouse / joystick). We integrate three state LEDs in the casing to give a visual feedback of the power, charging, connection state of our Elasticcon prototype. The device is powered by a 3.7V lithium ion polymer battery and can be charged via an external Micro-USB connector of the Arduino. Our battery has a capacity of 1000mAh for a total of about 3.7 Wh. Larger batteries are still possible if required. Elasticcon can be charged and programmed via an external Micro-USB connector, that is mounted at the bottom of our prototype. Starting from the sketch, we carved and shaped a polystyrene block to an appropriate form that met all of our requirements. To achieve a smooth and robust surface, we reinforced the polystyrene model with some layers of plaster and sand the surface area with grit paper. Based on the result of these iterative form-finding process with polystyrene and plaster, we created a negative mould based on the final sanded and waxed model. The negative mould serves as the starting point for the final case building with fibre-reinforced polymer. In order to regain the smoothness of the surface, the hardened FRP-form is plastered and sanded again and compounded to a electrical component optimized final form, which have a side door and a strengthened thumb-joystick mounting position and several additional mounting holes for the micro usb connector, LEDs and switches. All parts were fit into the casing and disassembled again after all fine adjustments. As a last step the casing was varnished and sealed in black. All components are mounted on our central board, which basically consists of a perfboard, many resistors, wires, our Arduino and bluetooth module and the retractable winding mechanism. The central board and its form served as the starting point for the case. We explore the high potential of elastic controllers for casual interaction in mobile and ubiquitous computing scenarios. While several remote interaction techniques with handheld or body-worn devices have been proposed, the usage of string-based, elastic interaction is still underexplored. Therefore, we first introduce a systematic design space along the axes reference system, interaction dimensions, sensing methods and haptic feedback. Our main contribution is Elasticcon, a versatile, wearable device with a retractable string and a set of exchangeable traction knobs. This elastic controller provides several degrees of freedom and allows rich interaction techniques. As a result of an iterative design process, we also contribute two working prototypes for belt-worn and handheld use. To demonstrate their versatility, we implemented several promising application scenarios. We tested Elasticcon in three smaller user studies investigating qualitative usability aspects and found initial evidence for elastic controllers as being comfortable, casual and yet accurate interaction devices. While trying hard to cite all related work, we missed the following one in the final paper and therefore add this reference for completeness. A. Kulik, D. Paneque, J. Hochstrate. In Proceedings IEEE Virtual Reality Workshop Beyond Wand and Glove Based Interaction. Chicago, March 2004, pp. 25-27.